Our smooth and easy to apply All-Natural Body Balm Stick is a daily essential to heal, strengthen and protect rough, dry or cracked skin on heels, hands, elbows, knees, feet and body. Creates a gentle moisturizing barrier. Good for working hands, gardening hands and hands that are in frequently washed or in water. Anti-inflammatory and quick absorbing with an all-natural soft clean scent. Leaves skin silky smooth and soft. 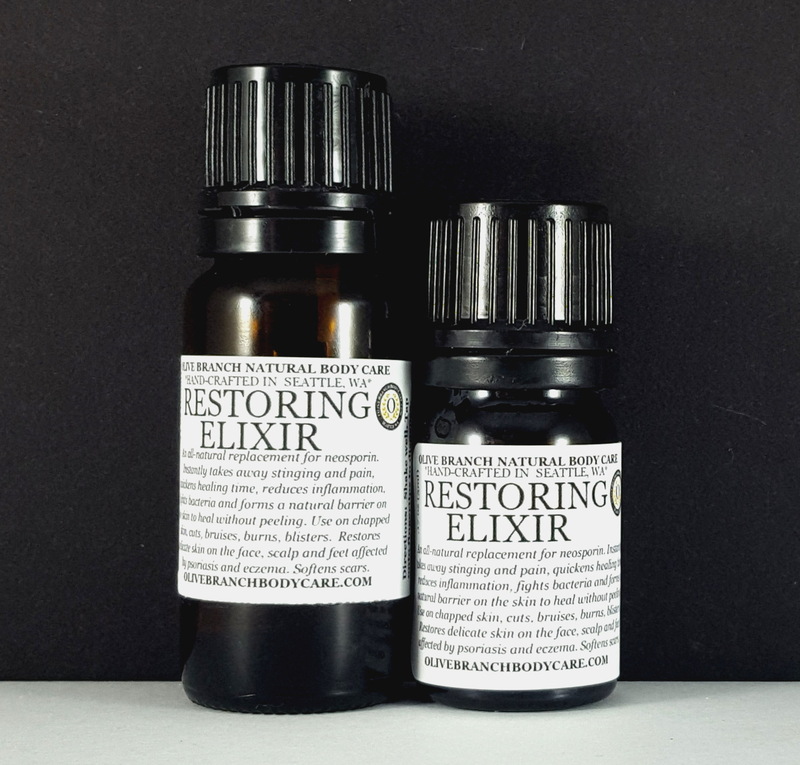 Proven helpful for psoriasis on the hands, feet and body (use our All-Natural Restoring Elixir for help with psoriasis on the delicate areas of the face and scalp). Ingredients: Butyrospermum Parkii (Shea Butter), Organic Cera Alba (beeswax), Theobroma Cacao (Cocoa) Seed Butter, Lanolin, Olea Europaea (Olive) Oil, Organic Borago Officinalis (Borage) Seed Oil, Organic Simmondsia Chinensis (Jojoba) Seed Oil, Butyrospermum Parkii (Shea Butter) Extract, Persea gratissima (Avocado) oil, Tocopherol (Vitamin E Oil), Citrus paradisi (Pink Grapefruit) & Apricot Essential Oils, Hippophae Rhamnoides (Sea Buckthorn) Seed Oil, Melaleuca Alternifolia (Tea Tree) Leaf Oil, Lavandula Angustifolia (Lavender) Oil, Citrus Bergamia (Bergamot) Fruit oil. "I battle with Exzema, a sore knee and elbow, and a few pimples here and there. This business intrigued me so much I bought a trial size to test it out. I LOVE THIS PRODUCT !! I had to buy a full size bottle, it works so well . It is a magic wand that rids pimples over night , sore muscles, dry elbows, feet, reduces velcrose veins, dry skin, eczema , inflammation of my knee and elbow and there under eye cream ROCKS as well. I will be a long time customer to come!!! Thank you Olive Branch!!!" "I love your hand, foot and body balm. I got it for some of my coworkers. We work in an environment where we are constantly washing our hands so our hands and fingers are super dry all the time. Also, our finger tips and the top of our hands split open and we use the balm its amazing how fast it really does work to close the splits back up and take some of the pain away. "Your body balm is the only thing that heals my husbands cracked finger tips in the cold dry winter months! "I apply it to my heels and callouses on my feet just like applying lip balm to my lips. I roll it over my feet . Besides it feeling good, my heels have never been smooth like they are with the Body Balm. I actually like my feet now. No other lotion, including natural lotions, helped my feet like the Body Balm has. " 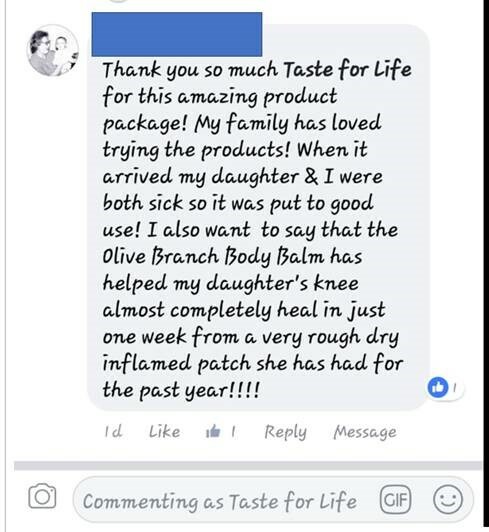 "I have been using the stick form of your Natural Foot and Hand Balm for 6 months on a 4" plaque of psoriasis on my lower back. The results are amazing - the spot is barely visible! It also no longer itches. I am now using the balm on other areas of psoriasis with great results!"